While Allison is away sunning herself, Bart from www.bartb.ie takes over to guest-host the show. Allison put out the call for content, and the listeners responded magnificently – we have a jam-packed show today! Allison was afraid there’d be too little content – not a chance, so buckle-up for a long show! Our first segment was sent in by listener Caleb Fong. Dear Allison and fellow Nosilla Cast listeners. First the problem to be solved. I have an old G4 Mac Mini and I cannot use all the new niffty audio menu bar features found in Snow Leopard. Solution: A lovely little app called SoundSource. SoundSource is one of those apps that does one thing and does it well. It puts all of your inputs and outputs in one menu bar item, which looks like a pair of headphones, with volume sliders for each of the audio sources. And if you happen to be one of those lucky people that has more than one audio device hooked up to your Mac it will allow you to easily switch between them. Getting and installing it is just as easy as using it. You get it by going to their website and clicking the “freebies” link. Then look for SoundSource on the page. After you download and open the .dmg file, you drag the icon into you applications folder. You do need to double click the app to start it the first time. Although, in the future, if you want to skip that step you can set the app auto launch when you login. You can do this through the same drop down menu that you use for all the other features of SoundSource. How much is it? A whole lot of of nothing. It’s free! Wheeee! *ahem* You can download it at Rouge Amoeba.com, that’s R-o-u-g-e A-m-o-e-b-a dot c-o-m. As they say weird name, good software. Our Second listener segment in by Evan. Hello Allison and Nosillacast listeners. Its Evan From the iPhone app weekly podcast coming at you with another review of a great iPhone app. This weeks app is convert by tap tap tap. Lets start with a potential problem. It seems like every country uses different units of measurement, and especially if you are in the US, it is often that you need to convert units of something, into units that other people use. When you launch the app you are given a very clean looking interfaces with a list of units above. And a number pad below. Lets focus on the Top of the screen where the units are located. On the left there is the list of the different types of unit. there are basic units like Temperature, weight, length, etc. But there are also more obscure ones like time, typography, pressure, computer units, angles, and more. To select the type of unit you slide up and down to move through the list, once the unit you want it highlighted, just lift your finger, and it will select it automatically. To the right of that there is the option to set your starting unit, and your end unit. For example, if I choose to convert length I get will set the starting unit to, say, miles, then down below on the number pad, I enter in the number of miles, and to the right of that I set the destination unit to say, kilometers. It then automatically tells you the number of, in this case, kilometers in a mile. Miles and kilometers are 2 very basic units to convert, just under the length it has things as obscure as Ångströms, and microns, all the way up to light years. Thats about it. It is a simple, elegant app that comes in very handy in many situations, especially if you are traveling overseas, or talking to our friends from across the pond. I would highly recommend getting this app if you ever need to convert from one unit to another. And for $1.99 in the app store it is a very reasonable way to do this. I gave Allison the iTunes link which I am sure she will put in the shownotes. To find out more about what I do you can follow me on twitter at twitter.com/vanmo92. Connor asks why the people who run the internet don’t just make everything use SSL or TLS – surely that would make things a lot more secure? The answer is that the internet simply doesn’t work like that. There is no one who physically could just flip a switch and make the entire internet use SSL/TLS. The internet protocols just shunt packets of data from one machine to another. The protocols are totally data-agnostic. People who write apps that use the internet are free to dream up any protocol they wish to communicate over the internet. This is what makes the internet great, and why it’s such a hot-bed for innovation. It is designed from the ground up not to care about, or indeed even be ware of, the data it’s sending. The down-side of course is that it’s chaos out there – a real wild-west! When people are developing new protocols they can of course choose to implement encryption, but how they do it is entirely up to them. Many do opt for TLS (the new version of SSL), but they don’t have to. They could use anything computer scientists could dream up! In short, no one pulls a switch to make the whole internet SSL/TLS because there is no such switch! If you’re listened to any of my podcasts you’ve probably heard me complain about the long wait for my 27″ iMac to arrive in work. It took 5 1/2 weeks but it finally came this week! I was most relieved when it wasn’t cracked, or DOA or in any other way defective. I’ve been using it for a few days now and I’m in love! The screen is HUGE, and it completely changes how you work. I’m sure myself and Allison will dedicated a CCATP to talking about this wonderful machine some time soon. The most surprising thing though is how quickly you get used to the big screen, and how quickly it feels normal. When I look at my 20″ cinema display now it feels TINY! People have been asking me on Twitter to post a pic, so here it is! 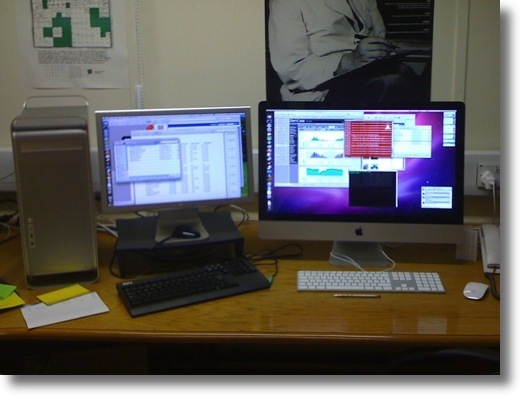 It shows my previous work machine (A Dual G5 PowerMac with 20″ Cinema Display), next to the new 27″ iMac. It’s quite a contrast! It’s also shocking that the new machine is half the price the old one was when it was new! If you’ve listened to the Mac Roundtable lately or followed me on Twitter, then you’ve heard my rantings against the AppleTV. Steve bought it for me for my birthday in April and we hacked it using the ATV Flash hack which lets you do more interesting things with it than the great and powerful Steve Jobs ever intended. Our main reason for wanting to do all this was to be able to hook up an external USB drive with disk images of all of our home movie DVDs on it, rather than dragging out of the DVDs Steve has made for us over the years. We also thought it would be fun to be able to play our music through the AppleTV, show our photos in slideshows and maybe even start renting movies through iTunes. 6:30pm Switch receiver to ATV. nothing. Restart ATV by unplugging and plugging back in. 6:32pm Remote doesn’t work. have to unpair and repair remote. 6:35pm Start searching videos. Decide on The Ugly Truth which I noticed was available last week at Blockbuster. Choose it. iTunes says “not available till 12/25”. that’s 19 days from now. great. 6:37pm Decide to change gears and watch Terminator 4. Decide we might as well get HD after all of these problems. 6;38pm Pay, and THEN it tells us it will take 51 minutes to download. We have 20mbps download speeds and yet it will take nearly an hour? 6:40pm Wait few thinking maybe it will speed up and at least let us start watching while it downloads – and the time extends to 58 minutes and it still won’t let us start watching the movie. 6:42pm Try to find a way to cancel. iTunes has no cancel button. 6:50pm Drove to Blockbuster to rent the movie we really wanted, plenty of The Ugly Truth available. 9:36pm Finished watching The Ugly Truth two hours later. iTunes says that Terminator is 73% downloaded and it STILL was not available for viewing while it downloaded! Remember all my friends and Twitter associates telling me I just don’t “get” the AppleTV? Here I was not trying to use the hack or anything, using just the functionality Steve Jobs wanted me to – he got my $5 and I didn’t get to watch the movie I wanted from Apple and I didn’t even get to watch my second choice! Blockbuster for the win this time. On the MacRoundtable Adam Christianson and Katie Floyd suggested that perhaps the real problem was that I really wanted a Mac Mini. That got me to thinking. The Mac Mini might really be the answer. Most of what we want the AppleTV to do are things a Mac Mini could do in its sleep. Well ok, not asleep, but maybe with one hand tied behind its back. The Mac Mini can play DVDs. the Mac Mini can do iTunes, stream from both Steve and my libraries, play podcasts, take an attached USB device, and surf the web. Steve had tried to use the ATV hack to surf the web so he could watch the live show 5pm GMT-8 on Sunday nights at podfeet.com/live but the AppleTV wouldn’t do Flash. So with a Mac Mini, we could do ALL of this! So finally I broke down and went to Apple, bought a Mac Mini and I gotta tell you, we’ve never been happier. Our next listner segment is from listener George. To all the Podfeet gang, Allison, Steve, Bart, Honda Bob, Rose, Jane, Pat, Crazy James, and so many more, Merry Christmas and an even better New Year for all of us, and Jobs (not Steve!) for all. That said, I’m reviewing the just released Nokia N900 internet tablet & cell phone the big brown truck left at my office yesterday. The N900 is a Quad Band GSM “world phone,” but it is sold by Nokia as an internet device. About the size of an iPhone, but heftier. You can find plenty of videos about the phone and what it does on YouTube. They make it look a lot easier to use than I’ve found it thus far. My best reason is my grandfathered T-Mobile family contract that is much cheaper than the equivalent iPhone deal at AT&T. But the phone itself has some advantages over the iPhone. A 5 megapixel camera with dual LED flash. Memory expandable to 48 gig, 16 gig of which is hot-swappable. A user replaceable battery. A nice physical slider keyboard. The N900 is sold unlocked only, so you won’t have to worry about Big Brother Jobs objecting to what you do with—or to—YOUR phone. The N900 runs Maemo, an open source version of Debian Linux. There’s an active developer community, and published SDKs. The first release of FireFox Mobile will be on the N900 and a Beta is available now. Unlike the iPhone, the N900 plays Flash natively. For Bart, Linux on the phone means he can press the icon for X Terminal, and go at it. For the rest of us, there’s hope Linux developers will port lots of good applications. Hope. That’s the term for the N900. I’ve already encountered some serious frustrations. Out of the box it came with what I guess was a European address for the T-Mobile WAN. I thought I was back in the days of Windows with lockups and reboots. Trolling up the right WAN designator from Google fixed that. The N900 has a resistive touch screen. Science lesson: it works like a bunch of little switches. Push and you make an electrical connection. The capacitive screen of the iPhone works by reading an electrical charge your finger makes. It is possible to use a resistive touch screen with gloves on, something no doubt important in Finland where Nokia headquarters. South of the Arctic Circle, not so much. One effect of the resistive screen is that Nokia includes a stylus with the N900. If you had a Palm gadget, you’ll remember the stylus. This one is NOT for writing, though I presume some applications for drawing and handwriting will come along. It is for pushing the tiny screen “buttons” that, in my case, seem unresponsive to my finger. The stylus is a small, matte black, stick which will be easily lost, and I’m already looking to buy replacements in bulk. The Apple touchscreens seem much more usefully responsive. The N900 User Interface is my biggest issue. I had a Palm Treo and have an iPod Touch. Both are much more intuitive than the N900. There’s no physical “Home” button at the middle bottom like on the Touch and iPhone, and one would be a real help. Right now I’m at the bottom of the N900 learning curve. Right now I’m thinking there’s no reason there should be a cell phone learning curve. Nokia does provide a Mac program to interface to the N900’s multimedia. After downloading that program, it sucked my test pictures right into iPhoto over the provided mini USB cable. The N900 also pairs nicely with Mac Bluetooth. This morning I paired it with the Hands Free receiver in my Toyota, so what it does, it does well. I’m keeping the N900. After all, what’s life without a challenge? If you want to join me on the bleeding edge, the N900 tremendous potential. But if the rumored unlocked Google branded Android phone appears early next year, don’t be surprised to hear I’ve sent my N900 to Bart so he can hack at it with X Terminal. It is, after all, a GSM Quad Band “world” phone, well suited for Irish Belgians. Next listener Lee sent us a review of the Kodak Zi8 HD Pocket Camera. Unfortunately Lee didn’t send me the text of his segment so you’ll have to listen to absorb his wisdom. Our final listener segment is from the wonderful Rose. Rose shares a rather fun segment in honour of the “silly season” – at a suggestion from the lovely listener Gitta she reads the list of regular chatroom contributors in alphabetical order – sounds boring, but I promise it’s great fun to listen to! First we talk about the tech Lola took with her to college. Lola packed all her tech gear but forgot to pack her socks. various carrying pouches including belkin messenger bag. While talking about Lola’s impressive array of tech – we divert slightly into discussing the Magic mouse, and we get to the shock revalation that Bart actually LIKES the Magic Mouse! The first Mouse from Apple Bart hasn’t hated! There are 52 pockets, what more could a gadget geek ask for? Just wanted to mention that myluckybids.com is selling iPhones and macs for crazy cheap prices, it’s an acutions website. I got mine for $54…..Thank me for the head up! I got my Apple TV 4 months back, use it without hacks. Absolutely no paring probs with the remote, fast downloads and a great viewing experience with pics and videos.